Thank you so much to Alen for sending this postcard from the island of Mauritius. Geography Cat thinks that this is a fascinating country. The island of Mauritius is only 65km long and 45km wide (just smaller than the county of Nottinghamshire); together with a handful of other smaller islands it makes the nation of the same name, Mauritius. The islands were formed by gigantic volcanic eruptions, although the area is no longer volcanically active. The location of Mauritius, notice how the location marker is actually larger than the country it marks! It is counted as being part of Africa, even though it is located 2000km from the south east coast of continental Africa. It boosts the second highest human development index score of all African nations (after the Seychelles), and has a population of 1.3 million. With its natural beauty, over 150km of white sandy beaches, good climate and the world’s third largest coral reef Mauritius attracts many tourists. In fact, 1.3 million tourists visited there in 2017; the same number as the total population. The projected figure for 2018 is even higher, at 1.4 million! Therefore it’s easy to see that tourism accounts for around 30% of the annual GDP of the country and has played a vital part in its economic development, especially since independance from colonial rule in 1968 (Mauritius was first declared a Dutch colony, then a French one, and finally a British Colony prior to independence). However, the development of tourism does present a challenge to the natural environment. Mauritius is, and was, home to some of the world’s rarest plants and animals. Prior to the arrival of the first Portugese sailors to Mauritius in 1507 there were no land mammals there at all, this meant that many birds had evolved to become flightless (as they had no need to fly away from predators). The dodo was one of these flightless birds, it was a huge pidgeon-like bird and regrettably it made a tasty meal for many sailors and settlers who killed them for their meat. Non-native species such as rats, pigs and monkeys were introduced to the island and very quickly took advantage of the dodos’ ground nests by eating the eggs. The species was quickly reduced in number and records show that the last of them died, or were killed, in 1680. The species is extinct, Mauritius was its only home and there will never be another dodo. 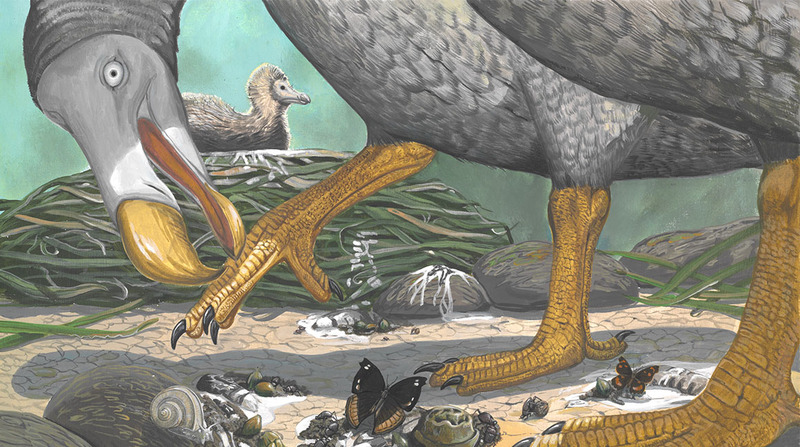 Painting by Dr Julian Hume of a dodo, its nest and hatchling. Dr Hume has even made a 3D virtual model of the bird, sadly the closest we can now come to seeing the real thing. The Lost World of the Dodo is an awe-inspiring project by a team at the Natural History Museum in London, you can find out more here. The painting above is by Dr Julian Hume who works as an avian palaeontologist. This means he is a scientist who specialises in studying the ancient remains of birds, usually fossil remains but in this case there is one remaining actual skeleton of a dodo. Over 100 other species have become extinct in Mauritius and although tourism brings economic benefits to the nation it is easy to see that such large numbers of tourists (equalling and even exceeding the population) could have a potentially devastating impact on what remains of the natural environment here. And that’s why tourism must be developed in a sustainable way. Geography Cat will tell you more about sustainable tourism in the future, stay tuned!